ABC’s hit fantasy drama ONCE UPON A TIME returns tonight with a brand new episode called, “Tiny.” On tonight’s show the giant unleashes his vengeance on Storybrooke, and Mr. Gold attempts to depart Storybrooke to search for his son Bae — with Emma and Henry in Tow. Did you watch last week’s winter premiere episode? We did and we recapped it here for you! On last week’s Dr. Whale was tasked with mending Hook’s wounds and performing surgery on the stranger whose car crashed upon entering Storybrooke. But some of the townspeople fear that the stranger may have seen magic — which could expose their true identities to the world — and thought that leaving him to die would be the best solution. Meanwhile, as Mr. Gold tried to reunite with a despondent Belle, Cora attempted to reunite with daughter Regina; and in the land that was, Victor desperately wants to prove to his disapproving father that he can, indeed, bring back the dead. On tonight’s episode kidnapped and brought to Storybrooke by Cora, the Giant (Jorge Garcia) unleashes his vengeance on the town when a case of mistaken identity leads him to try and settle an old score with David. Mr. Gold, accompanied by Emma and Henry, attempts to depart Storybrooke – hoping to keep his memory intact when he crosses the town line — and heads to the airport in search of his son Bae; and Greg (Ethan Embry) questions Belle as to what she saw on the night of his car accident. Meanwhile, in the fairytale land that was and against his brothers’ wishes, Anton, the Giant, climbs down the beanstalk and attempts to befriend some humans – whose intentions may not be so noble. Guest starring are Lee Arenberg as Leroy/Grumpy, Colin O’Donoghue as Hook, Beverley Elliott as Granny, Alan Dale as Spencer/King George, David-Paul Grove as Doc, Faustino Di Bauda as Sleepy, Jeffrey Kaiser as Dopey, Michael Coleman as Happy, Mig Macario as Bashful, Ethan Embry as Greg Mendell, Jorge Garcia as Giant/Anton, Abraham Benrubi as Arlo, C. Ernst Hearth as Abraham, Andre Tricoteux as Argyle, Ingrid Torrance as severe nurse, Cassidy Freeman as Jack, Todd Thomson as business man and Byron Bertram as TSA agent. Tonight’s episode 13 is going to be exciting, and you won’t want to miss it. So be sure to tune in for our live coverage of the season 2 episode 13 of Once Upon A Time — tonight at 8PM EST! While you wait for our recap, hit the comments and let us know how your excited you are about Once Upon A Time being back! Check out a sneak peek of tonight’s episode below! Gold comes to pick up Emma and she insists she’s bringing Henry along. He tells her they’ll have to get another plane ticket and she’s surprised they’re flying. Charming pleads with Gold to take good care of them. In Gold’s Caddy, they’re heading across the town border and are wondering if the talisman will work – they cross, there’s a twinkle of magic but he’s still Rumple, so the trip is on. Charming and Snow are heading out to search for Cora and decide it shouldn’t be hard to find a powerful sorceress in a small town. They open the door to leave and there’s Regina – speak of a powerful sorceress and one appears! She tells them she knows they think she’s responsible for Hopper’s death and they tell her he’s alive and it was Cora that did it. Regina says if Cora’s back, she needs to see Henry so she can protect him. Snow tells her Henry has gone with Gold and Emma out of town. Regina wants to know why they didn’t notify her and they tell her they didn’t know where she was and that Emma can do what she wants with Henry. Regina concedes both are true and leaves. Charming and Snow head out to look for Cora. They come to see Hook who’s recovering from his injuries. Grumpy’s along with them. They want to see his ship and he says there’s no way Cora would come back there. 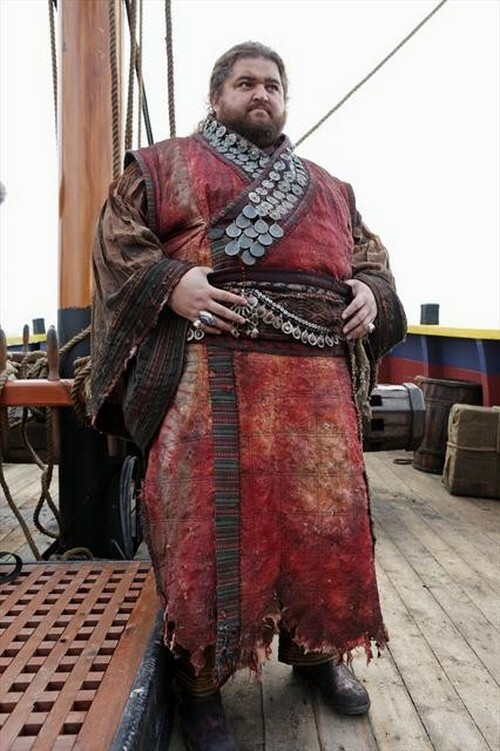 Hook takes them on board his ship – they want to look for any clues to where Cora may be. Grumpy asks if Hook can sail his ship back into their old homeland and he tells him there has to be a magic portal to sail through. Hook shows them Cora’s secret weapon. It’s a dude in a box. There’s a flashback to a dinner with the guy in the box and his family. His name is Anton (aka Tiny) – he’s apparently the smallest of the lot. They all stand to toast and there’s a tiny harp that makes a sound when it’s knocked over. His father chastises him for his fascination with human kind. Turns out they’re giants and they had to quit trading beans with the humans because of how badly the humans acted. Tiny wants to know why they even grow beans since they don’t trade them anymore and his dad says because of what they do. Tiny’s brother Abraham breaks the toy harp which angers Tiny and sends him running out of dinner. He climbs down the beanstalk – looks like he’s running away from home. Hook tells Snow, Charming and Grumpy that Cora captured Tiny and made him travel-sized for easy transport to Storybrooke. Hook says he doesn’t know what she intends and tells him to wake up the giant and ask him. Snow unlocks the door to his box and tells him he’s safe. She asks his name and he tells her Anton. He asks where the witch is and is upset because he was made small. 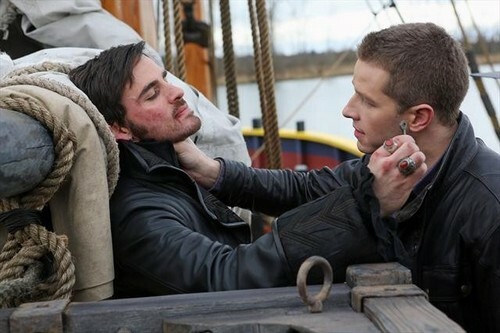 He sees Charming and says “you” and then attacks him – he punches him and sends him flying across the ship. He tells them he remembers what they did and will make them pay for their evil. He runs off! Ruby finds Belle watching TV in the common room of the mental ward of the hospital. She doesn’t remember her. She tells her she used to come in to her Grandma’s diner all the time – she brought her a book – Jules Verne’s Mysterious Island. Belle asks if they were friends and she said yes. She tells her that the man she was with healed her with magic. Ruby says she must be remembering wrong. She calls her Belle and she freaks out and asks why everyone keeps calling her that. She goes a little crazy and they sedate her and haul her out. They tell Ruby she’s been doing that a lot. Ruby runs into Mr. Mendel (the guy who ran into Hook at the state line) and wishes him a speedy recovery so he can leave town and get back home. At Granny’s, Grumpy and Snow want to know why Anton wants revenge against Charming. He says it wasn’t him. Flashback to Charming bedding a beautiful woman. His dad barges in and tells him there’s a giant on the loose – except it wasn’t Charming (aka David) – it was his twin brother James. Aah… the evil twin. His dad wanted James to capture the giant for them to use. James finds Anton lurking around a tavern and he tells him he can have ale if he can pay. He introduced himself and asks Anton why he’s there. Anton admits he’s curious about the human world and tells them he’s too big for here and too small for back home. Jacqueline (aka Jack) offers him a magic mushroom that will temporarily shrink him so he can fit in – he tells them he can’t pay them for it and she says his happiness will be payment enough. Hmm… So there’s Jack and there’s a giant – sound familiar? [8:44:20 PM] Rachel Rowan: At the airport, Henry, Emma and Gold check in for their flight. Henry asks Gold if he’s ever been out of Storybrooke before and he says no. He asks if he’s nervous and he says no. He asks how it feels not to be able to use magic and to be like everyone else and Gold just wants him to be quiet. Gold is freaking out about the security procedures. He thinks taking off your shoes is uncivilized. When they want him to take off his scarf, he freaks, but Emma promises him it will be okay. They make it through and Henry wants to go to Cinnabon. Regina finds Hook and asks him why he didn’t kill her mother. She tells him she and Cora have made up. She wants to know if the do-gooders found the ship. He says they did. She tells him her mother needs her things. Hook tells her that the shrunken giant was set loose and is after Charming. She says it’s just the distraction they need. Anton wanders through town, dodging cars and freaking out. Flashback to Anton going into the tavern with Jack and James. He tells them his giant family bullies him. James says sometimes you have to leave home to find your real family – the people you should be with. Jack tells him he’s meant to be here with them. James tells her to make sure Anton has everything he needs. Some musicians strike up and one has a harp. He tells Jack he always wondered how it sounded. James is arguing with the barkeep and Jack tells Anton that the kingdom is in debt to another kingdom and they have to find a way to pay it off. She says a magic kingdom would help pay it off and he says he doesn’t have any of those, but can get treasure if that will help. Jack kisses him on the cheek and says he’s their hero. Regina finds Anton wandering in the woods and tells her to stay back – says he hates human. Regina tells him she can help him kill Charming and if he wants to destroy the town to get to him, she doesn’t care. She offers him a blue mushroom that she promises will return him to his former glory. She laughs evilly as he nibbles it and grows huge. She tells him it won’t last forever and he should get to work. Back at the airport, Gold is nervous. He excuses himself to go to the restroom. He locks himself in the largest stall and paces. He punches the metal toiletseat cover dispenser until his hand bleeds. Henry comes in and calls out for him and tells him they’re boarding soon. Gold tries to heal his hand and can’t. Uh-oh. It’s not just that he shouldn’t use his magic outside of Storybrooke – he can’t, even if he wanted to! Flashback – Anton is loading up tiny human treasure into a sack when his dad comes in and demands to know where he’s bee – he says they were worried. Anton tells him he’s been in the human world and likes it there and that he’s going to go back. The sentry birds cry out and his dad accuses him of being followed – of showing the humans where the beanstalk was. Present day, Anton is terrorizing the town, throwing cars and acting out. Charming runs off and calls out to Anton, telling him he doesn’t have to do it. He tells him it wasn’t him – it was his twin brother who was raised by a ruthless father. He tells him James is dead. Snow runs up and tells him they’re on his side – that they are Emma’s parents. He says if Emma will vouch for them, he’ll stop. They tell him she’s out of town and he accuses them of lying and continues his rampage. Flashback – Anton’s dad finds James and Jack and they tell him they’re up there for the beans – all of them. Jack pulls out a sword and demands they take them to the beans. The head giant says they’ll fight and James and Jack draw swords on them. Present day, Snow, Charming and Grumpy are running in terror from the giant. The plan is to lead him away from town, but they realize they’re heading for the town line. They stop and Charming offers Anton his surrender in exchange for the safety of the town. Anton agrees. He pounces at Charming and ends up buried in the ground. Just then, the magic of the mushroom wears off in a puff of blue smoke. They look down the hole he disappeared in and see Anton regular sized again and clinging to a pipe over a seeming abyss. The human armies are overrunning the giants – they are using poisoned swords! His dad tells Anton he must prevent the humans from getting the beans – otherwise, they will use them to destroy other realms. Present day, the townfolk work together to rescue Anton. Snow kisses Charming and tells him most people would let him die after what he did. Charming is lowered into the hole – he’s going to try to save Anton. He holds out his hand to Anton and he refuses to take it. He tells him he doesn’t want to go back up there. Charming says he’ll die. Anton says maybe death is better than the pain of life. Charming says if he really wanted to die, he would have already let go. Anton takes his hand and they pull the guys up. Snow hugs Charming and Anton thanks him for saving his life. He tells him that humans are not all the same. He says he doesn’t know what his brother did, but they’re not all like that. Anton tells him he has no idea. James and Jack are looting the treasure room when Anton’s dad is stabbed by the poison sword, but manages to fatally wound Jack. She calls out to James who tells her “too bad” and takes off with the loot. His dad tells him to burn all the fields and beans. He promises he will. His dad hands him a glass vial with a cutting from the bean stalk and tells him one day he’ll find a new land to grow the beans in. The townies bring Anton into Granny’s – they tell him he can stay there. He says he’ll just camp in the woods – that he’s better off alone. They tell him there are all kinds in town – fairies, dwarves, werewolves. He asks if they ever want to go home again and they tell him they miss it, but have no way to get back. Anton asks him how the land there is and shows them his cutting – he tells them he can grow beans that can take them back. At the hospital, Belle is coming around when Greg comes in – he tells her he’s a patient too. He tells her he was driving the car in the accident. He tells her he overheard her talking about the guy with the ball of fire and she says she’s not crazy. He tells her he saw it too. Outside Granny’s, Snow and Charming share coffee and toast to not getting squashed by a giant. Charming says he wonders if he would have turned out bad if he had been raised by his dad like James was. Snow said he still would have been a good man and tells him she had fun with him today – she tells him she misses their adventures. He laughs and agrees that it was kind of fun. Charming tells her once the beans grow, they can go back and have adventures. She tells him if Emma won’t go back with them, then she won’t leave her. She’s worried about Emma and Charming assures her that they’ll be okay. On the plane, Henry is excited to be on a trip with his mom, going on a quest and eating Cinnabons. Gold (with his bandaged hand) is stressed out and Emma tells him it will be okay and they’ll find his son.